Don’t be like a deer staring at the headlights if you are going to go through life – that would be fatal, and you might just get run over by whatever problems that come your way. Instead, you should be like a deer in the forest – silent and stealthy, making sure that you do not end up on the wrong side of the trap or a hunter’s bow while being wary of all things. Either that or you could lead a far more peaceful existence – like the $14.79 Deer in the forest Clip Holder. 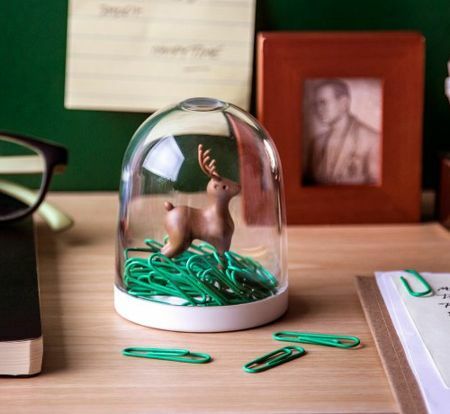 This is a must-have addition to any office desk, as the transparent dome depicts a cute little deer that resides in its own little world. Should you require a paper clip, just give the dispenser a little shake, and voila! A clip will fall out. It is easy to refill the base with a twist, too.